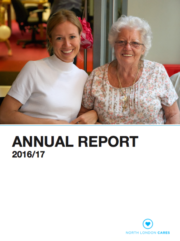 For the eighth year in a row, we spent the isolating winter months out and about, helping older neighbours stay warm, healthy, active and connected – and part of the community. Download the report to learn more about the project, including our method, case studies and a breakdown of the 606 interventions made on behalf of our older neighbours. 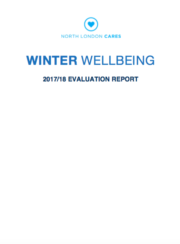 'Winter Wellbeing’ is North London Cares’ response to both the physical and mental challenges faced by older people during the isolating winter months. 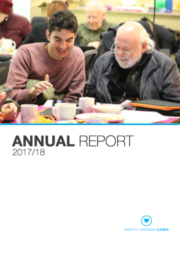 Download the 2017/18 report to learn how the project helped Camden and Islington's older neighbours stay warm, active, healthy and connected. 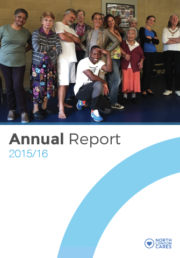 We're really proud to present North London Cares' latest annual report. 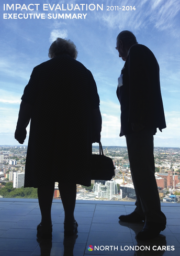 The report is packed with stories, data, images and case studies about our programmes, finances and the impact of younger and older neighbours sharing time and new experiences in our rapidly changing city. 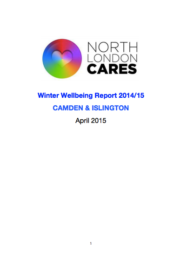 North London Cares' Winter Wellbeing project 2016/17 the sixth consecutive such project we've delivered, and the most targeted to date. The project helps older neighbours stay warm, active, healthy and connected during the most isolating time of year and has become a mainstay of community outreach. Download the report with the results, impact case studies and more. After nearly two years' work, North London Cares' full length evaluation, funded by the Cabinet Office and Nesta through their Centre for Social Action Innovation Fund, and undertaken by the social researchers Renaisi, contains data, case studies and further information about the Cares Family model and the impact of our work on older and younger neighbours and their loneliness and wellbeing. 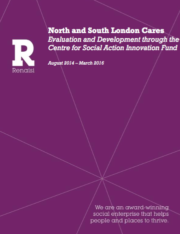 As part of our major impact evaluation carried out by Renaisi and funded by Nesta and The Cabinet Office, this document brings together the various curated evidence that, together, shows that our model is important and works. 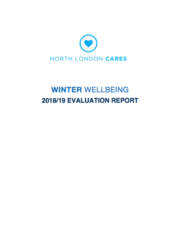 The Winter Wellbeing project has become a core part of North London Cares' work, with projects growing in each of the last five years and partnerships with local authorities and other organisations deepening. 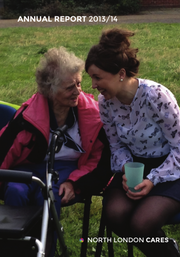 As well as playing a key role in community outreach and prevention of health crises in the most isolating time of year, Winter Wellbeing also introduces hundreds of older neighbours to our core Social Clubs and Love Your Neighbour programmes. 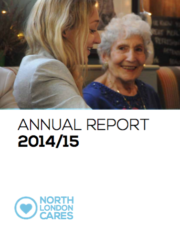 We're really proud to present North London Cares' sixth Annual Report. 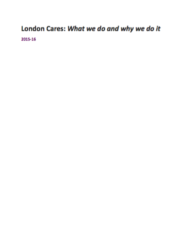 Delivery figures in this report cover the period January 1 2016 to December 31 2016, whilst finance figures cover the accounting year September 1 2015 to August 31 2016 as submitted in our latest annual accounts. Our Winter Wellbeing project mobilised young people to help their older neighbours in Camden and Islington to stay warm, active and connected during the most isolating time of the year. The project was commissioned by the joint Camden and Islington Public Health department to help us reach as many older neighbours as possible during the long, dark winter months. 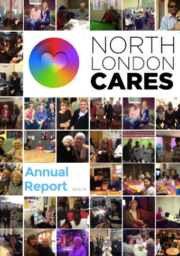 We're really proud to present North London Cares' fifth Annual Report. The 28-page report covers the period from the end of our last reporting period in August 2014 to the end of December 2015, and the financial period between September 2014 and August 2015. 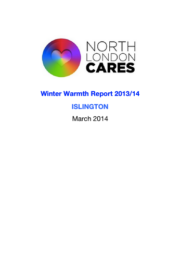 Read the full report about our Winter Warmth project within Islington. This includes detail on why and how we did it, as well as some evaluation on how we can make an even bigger difference in future years. 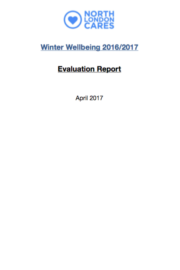 Read the full report with all the details and evaluation of what we did in Camden during the Winter Warmth project; about why this work is so valuable, who benefits, the outcomes – and how we can do even more. 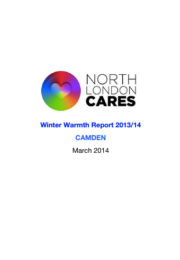 This is North London Cares' Annual Report for 2013/2014. It covers the period from September 1st 2013 to August 31st 2014. It contains information about our objectives, our core delivery work, where our funding comes from and our financial position. It also contains messages from our Chair and our CEO, and some detail about our plans for the future. 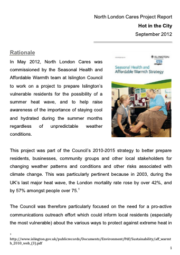 Read the full report of our efforts to help keep our older neighbours in Islington warm, active, healthy and connected between the winter months of November 2012 to March 2013. 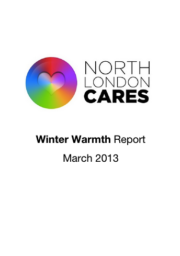 This is North London Cares Annual Report for 2012/2013. It contains information about our vision, background, projects, methods, fundraising, people, finance, governance and partnerships. 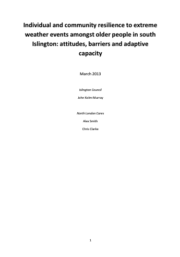 Between November 2012 and March 2013, North London Cares partnered with Islington Council to speak to nearly 500 people over the age of 65 in south Islington – on doorsteps, in community centres, by mail and in focus groups – to learn about people's views about and behaviour during extreme weather. 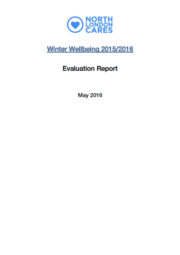 Read the detailed results, analysis, conclusions and recommendations from those conversations in the full report, which was funded by The Department for the Environment, Foor and Rural Affairs. 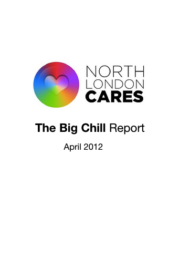 Read North London Cares' report on our big winter 2011-2012 project to help keep our older neighbours warm and connected, in partnership with Islington Council. 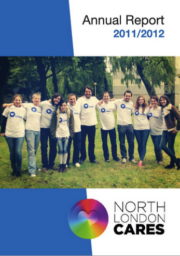 In the memorable summer of 2012, North London Cares embarked on a project, in partnership with Islington Council, to speak to 1,000 of our neighbours over the age of 65, to help make sure they stayed cool, connected, healthy and hydrated during the hotter months. Read about the purpose, methods, results and learning of that work in the full report.